Maryland crab isn't from Maryland: Chesapeake crab is a lie. Sorry, Marylanders. Your Crab Is a Lie. Over Labor Day weekend I went for a visit with my wife and her family to the vacation house of some friends of theirs down on the Gulf Coast of Louisiana. One afternoon I got in the truck with some of the other guys to drive down to a little crabbing operation (pictured above) where the local crabbers (an industry dominated by Vietnamese immigrants, apparently) would bring their traps to have the crabs sorted and weighed and placed into boxes. 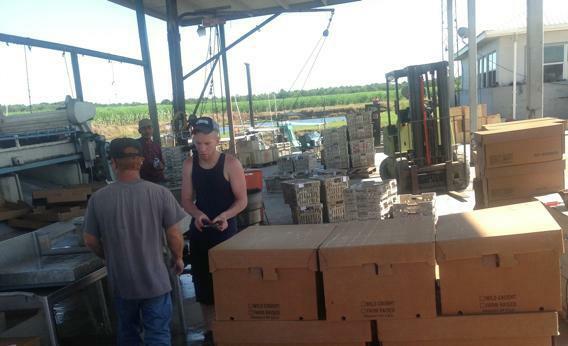 The sorters will happily sell you a box of crabs for your family crab boil, but it’s not primarily a retail operation. They were mainly getting ready to load the boxes onto a small refrigerated truck. The truck itself is bound for New Orleans, where its cargo will be joined with that of other small trucks from around Louisiana and then put into a large truck bound for … Maryland. Yes, Maryland. The American blue crab heartland. Ever since I read Jessica Sidman’s 2012 article on the real provenance of the Washington, D.C., area’s “Maryland crabs,” I’ve been trying—and largely failing—to persuade my friends who are native to this region that their local crabs are largely fraudulent. But now I’ve seen it with my own two eyes. A big truck full of crabs—crabs that look and taste identical to all the crabs I’ve ever had at Washington-area crab boils—bound for Maryland. And just on the trucking fundamentals, you might think Louisiana crabs would end up in population centers such as Houston, Dallas, St. Louis, Nashville, or Atlanta that are all substantially closer than Washington or Baltimore—especially since there really are crabs in the Chesapeake Bay while there really aren’t any crabs to be caught locally in inland Dallas. But it seems that crabs get shipped from far and wide to the Chesapeake area precisely because the Chesapeake has crabs in it. The historically plentiful nature of Chesapeake crabs has created a regional crab economy. Lots of local diners have a taste for blue crab. Lots of chefs and restaurateurs have good crab-based recipes. Lots of home cooks enjoy hosting crab-related events and have their own preferred methods of crab preparation. Over time, as the region’s population has grown, this local crab economy’s ferocious demand for crab has outstripped the local ecosystem’s sustainable level of crabbing. So the market demands that crabs be shipped not to crabless parts of America but to America’s crab-production heartland—the place where the secondary and tertiary elements of the crab economy are in place, and the finished product has maximum value. Correction, Sept. 3, 2013: This post originally misspelled Vermilion Bay, La.